The annual edition of Spectrum magazine will be inserted in this Thursday’s edition of the Record-Herald for subscribers. 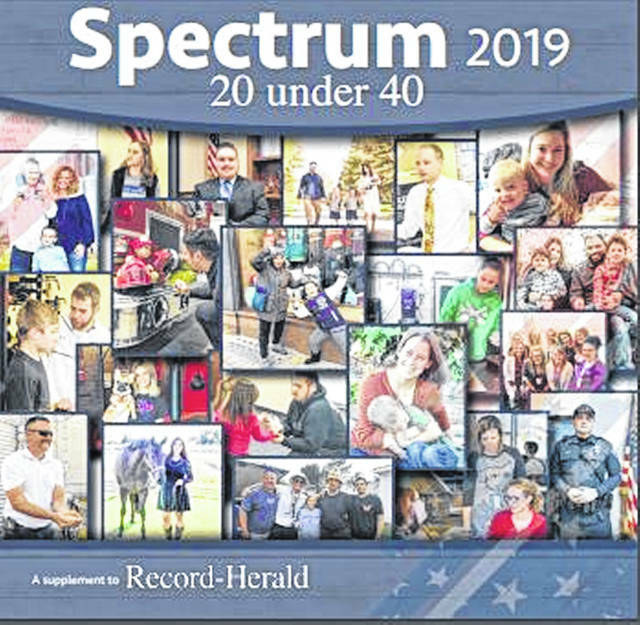 Additional copies of Spectrum will also be available for $3 each at the Record-Herald office, located at 757 W. Elm St. in Washington Court House. Based upon our staff’s interactions with many of these individuals, along with suggestions from the community, 20 individuals under the age of 40 were selected. As with any selection process, this is certainly not an all-encompassing list of people under 40 who make a difference in this community. There was a multitude to choose from. Unfortunately, we had to omit several local residents under the age of 40 who were more than qualified to make this year’s magazine. The plan is to feature these individuals in either a future Spectrum or an upcoming edition of the Record-Herald. The mission was also to find young people spread across a wide spectrum of professional fields. Inside this year’s Spectrum, you will find educators, business owners, city and county officials, health enthusiasts, entrepreneurs, first responders, etc. Some of the choices were obvious and easy to make, others you may not have expected. Overall, we believe the group highlighted this year is a fine representation of the best of Fayette County.